Topshop Wrap Front Bodysuit 6 (s) Black Shirt Blouse Tee V Neck One Pc. Crisp pleats and intricate openwork detailing strike the perfect balance between Victorian romance the bohemian chic on this billowy blouse. Order size in parenthesis for best fit. Machine wash, line dry. Gently used item with no flaws. Bust: 13” Length: 22”. I try to make you aware of these when it happens but do not always see these myself when I receive them. Length: 7" From Under Arm Down. Waist: 30". 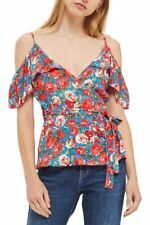 Topshop Ruffle Floral Wrap Blouse Size 4 Long Sleeve Boho Black Festival . Condition is Pre-owned. Shipped with USPS First Class Package. Beautiful layer crop top , gently used condition Please pay close attention to measurements Armpit to armpit 16 1/2 inches Length from shoulder to hem 23 inches Thanks for looking Check out my other items!! Pit to pit: 12” Length: 20” Approx. Color: Ivory. Style: Fashion, Casual. Machine wash. Do NOT open or reassembly the item, because we will not accept the item back. We will inspect the item when we receive the item. Dusty pink long sleeve oversized style with v-neckin excellent pre-owned condition. Shoulder to Cuff 23". Underarm to End of Sleeve 21". Length in Front 19". Length in Back 20". Viscose chiffon, feels more like silk. This is in lovely condition. Length 26’’. Good condition showing light wear from wash.
Topshop Orange Womens Petites Lettuce Edge Size 6 Crop Top. Shipped with USPS First Class Package. Ruffled trim plays up the retro appeal of this slightly cropped rib-knit tee. 73% polyester, 24% cotton, 3% elastane. Machine wash, dry flat. Top Shop Crop Top. Condition is Pre-owned. Shipped with USPS First Class Package. Special features: fabric has a nice weight to it with a beautiful drape. Length, shoulder to hem: 18". Chest, armpit to armpit: 18". TOPSHOP | Size 8 Crop Top Women’s High Neck Royal Blue Sleeveless Racerback. Condition is Pre-owned. Shipped with USPS First Class Package. Khaki green crop top. - Long sleeved and scoop neck. - Model is size 10-12 and 5’5. Light Blue Sheer Blouse with Tie Front and Button Cuff. 100% Cotton. This shirt is in great used condition. Semi-sheer finish & a raw hemline adds edge to a casual look in this crop tee. Finished in a soft stretch jersey blend, it features an all-over ribbed detail with a crew neckline. 65% Polyester, 35% Viscose. We will properly wrap every item carefully. We would be very happy to answer them within 24 hours. Great for festival season! Gently used item with faint stain on front of shirt as seen in pictures. Sleeveless Top. Type Sleeveless Top. Discover daily new arrivals in all seasons, sizes and styles that you can't find anywhere else. Color Beige. Material Polyester. Item Details. Super soft flannel. Details include -Black, Gray and White Plaid. Shoulder to Hem: 29"-30" (back-rounded hem). -Button cuffs. -Single front pocket. -Back hem longer than front. Type Tank Top. Discover daily new arrivals in all seasons, sizes and styles that you can't find anywhere else. Material Cotton,Polyester. Color Pink. Item Details. A slinky, stretch-cotton bodysuit with a cutout racerback. Round hemline. Front zip up with exposed silver zipper. Animal print. ▪️Length:25”. ▪️Condition:pre-owned. Excellent condition, no flaws. Type Tank Top. Color Grey. Discover daily new arrivals in all seasons, sizes and styles that you can't find anywhere else. Material Cotton,Polyester. Item Details. Length: 14.5 in. Material: %. Viscose: 100%. Features floral design with crochet holes detail throughout. Length: 23". Armpit to Armpit: 23". Bust 16”/Length 13”. Item sold as is. Length- 26". Pre-owned; excellent. Shoulder seam to seam- 16". Length: 21”. Size: US12. 100% Viscose. Sleeveless Top. Type Sleeveless Top. Color Grey,Grey. Material Cotton,Acrylic. Discover daily new arrivals in all seasons, sizes and styles that you can't find anywhere else. Item Details. Topshop Top. Condition is New with tags. Shipped with USPS First Class Package. Nice top. Can be for office or dressy to casual. Retails at $55. It’s a steal for the price! topshop plaid blouse button down. Condition is Pre-owned. Shipped with USPS First Class Package.